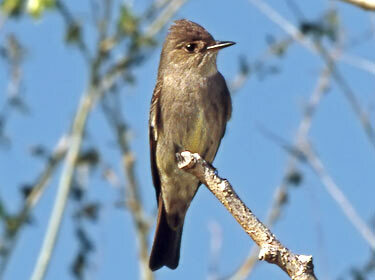 Strong and harsh “pee-wee,” compared to feeble “pee-a-wee” given by Eastern Wood-Pewee. Description: Sexes similar. 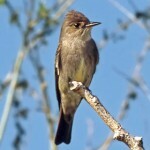 Almost indistinguishable from Eastern Wood-Pewee except by range and voice. 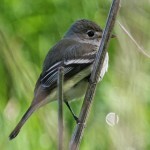 Dark grayish-olive above; dull white throat; dark gray breast and sides; belly, flanks, and undertail coverts whitish or pale yellow; no eye ring. Adults have whitish wing bars, while juveniles’ are buffy or pale cinnamon. Bill of adult has black upper mandible and dark orange lower mandible, while juveniles have an all-dark bill. Habitat: Mostly found in open, mature pine forests. Generally prefer conifer forests, but also use mixed woodlands. 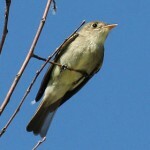 Where in Nebraska: Common spring and fall migrant and summer resident in west and northwest. Breeding range from Sioux, Dawes, and Scotts Bluff Counties, and east to at least Garden County. Field Notes: Generally occupy drier habitats than do Eastern Wood-Pewees. Fun Facts: Feeds almost exclusively on insects.